Small, sweet and perfectly balanced with a tinge of acid and a blush of pink freckles. I picked up these apricots last Saturday from the San Francisco Farmers' Market at the Ferry Building. I didn't make a note of the farmer's name, but I can tell you they cost $5 a tray. I've heard rumours that the apricot season is going to be short this year. If you are an apricot fan, don't let it slip you by. PS - This box is tiny (and very cute). Each apricot is smaller than a golf ball. Do you have any special plans for them (besides devouring them over a sink)? We never see lovely looking apricots like that in our shops. It's not from a shop, mum, that's why. It's direct from the farmer at the market. lovely, aren't they. i picked up some too! Wow! I'm really missing out. That is such a great deal for those apricots. I should really think about going to the farmers market at the Ferry Building again. Especially since I'm trying to add more fruit in my diet again. Hi Christine - thanks for the info - the company name isn't on my box- I checked before writing the article and I have just double checked again. Maybe they have two different types of boxes. 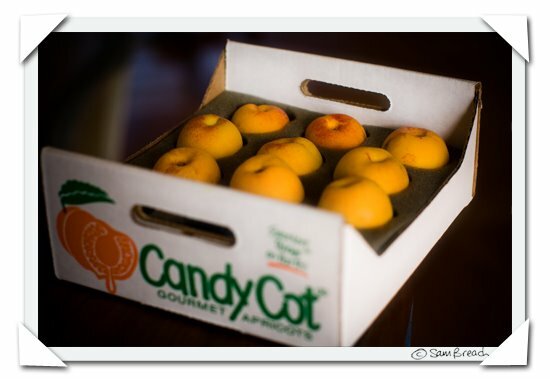 It isn't clear to me if Candy Cot is the name of the Company or a type of apricot. Yum Sam. These look delicious. Apricots are such a delicate fruit, so difficult to find right, I feel. In North America, apricot season usually begins mid-May and continues into August. Novel fruits, like Angelcot and Black Velvet, are part of the Proprietary Class of tree ripened fresh fruits, so the season for this class of fruits is even shorter.